Nisyros Вулкан-извержения: 1881-1887 - hydrothermic explosions of the crater "Micros Polyvotis"
1000-2000 B.C. - hydrothermic explosions of the crater "Stefanos"
The small round island of Nisyros is one of the more active but less known volcanoes in Greece. It is located south of the popular beach holiday island of Kos. The volcano is part of the Hellenic Arc, a curved line of volcanic centers which are caused by a subduction zone, and stretches from the Saronic Gulf opposite Athens via the island groups of Milos, Santorini, and Nisyros-Yali-Cos to the Bodrum peninsula at the extreme SW of Turkey. The last eruption of Nisyros were phreatic explosions in 1881-87. They left a moonscape with colorful craters and very active fumaroles. Nisyros is together with the volcanoes of the Cos caldera the east edge of the Aegean Arch with its active volcanoes Methana, Milos, Santorini. 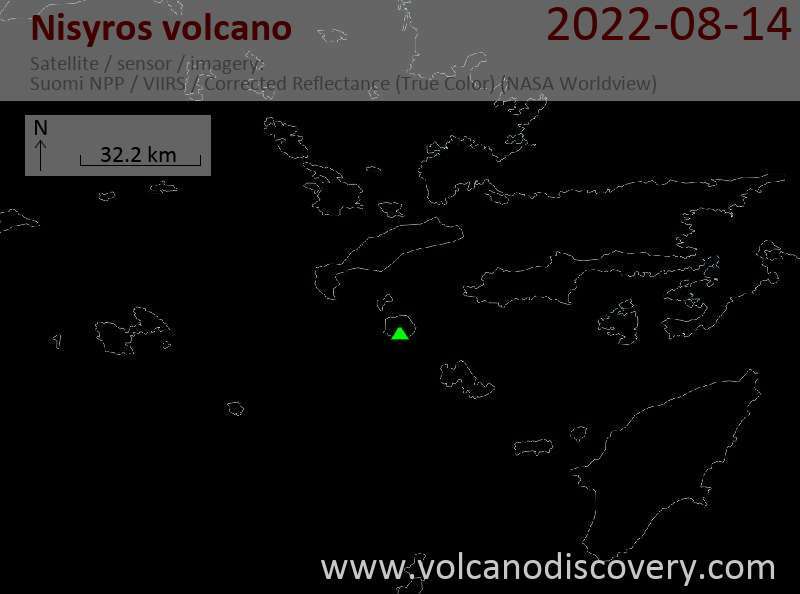 The Nisyros volcano is the most active remain of the Cos caldera that exploded aprox. 150.000 years ago. Nisyros, Yali, Strongyli, Pyrgoussa, Pahia and Kefalos (at Cos) are the remains of a zone that is considered to be still active. A Magma chamber below Nisyros is only 3-4 km deep and still rising up. Since 2000 when the Nisyros research program of the GEOWARN-Team started, the temperatures of the fumaroles have been changing from 98 C to 103 C in 2004. There was also a high tectonic (earthquakes) activity in the last years and so a program to prevent volcanic hazards is still ongoing.